When we were teenagers, my mom used to stock the freezer up with loads of frozen foods for me and my brother to bake up or microwave on a whim. Back in the day Kevin and I didn’t really have any real interest in cooking. We were more interested in ease and convenience. Even though it’s probably going to kill any foodie cred I have (as if I have any! ), I’m going to admit it for you right now: I love frozen food. I hang my head in shame, but really, even in shame, at least I’ll get to eat well. Unleash me on the frozen foods section at Costco and you’ll see what true happiness is. Okay, in truth, I actually don’t really eat much frozen food anymore (except for frozen gyoza, those I actually have in my freezer right now), but I do believe frozen food has it’s place in the world. One, it’s super convenient and two, looking at frozen food gives me great ideas for things to make. Case in point: puff pastry mushroom cups. I used to eat these little babies by the dozen after school. 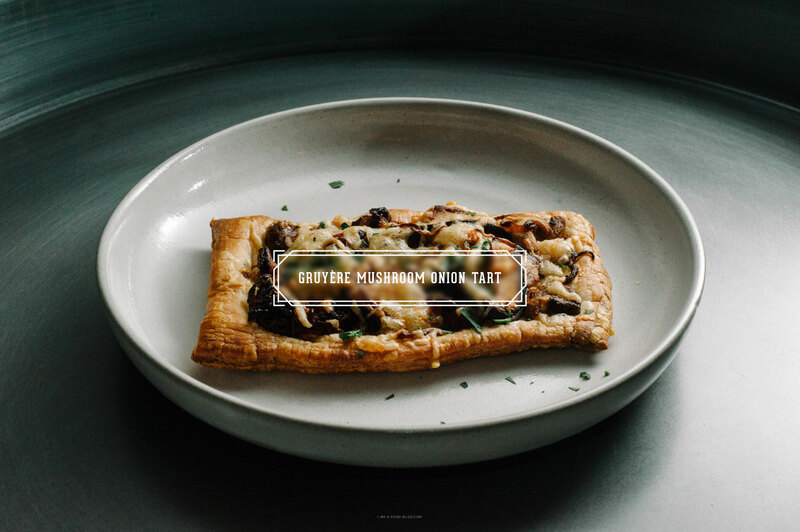 These mushroom onion tarts are even better. And…you can freeze them to pop into the oven when you need them. It takes a bit of time to caramelize the onions, but it is so, so worth it. Caramelized onions are melty, sweet and the perfect topping on sandwiches, eggs, or pizza. 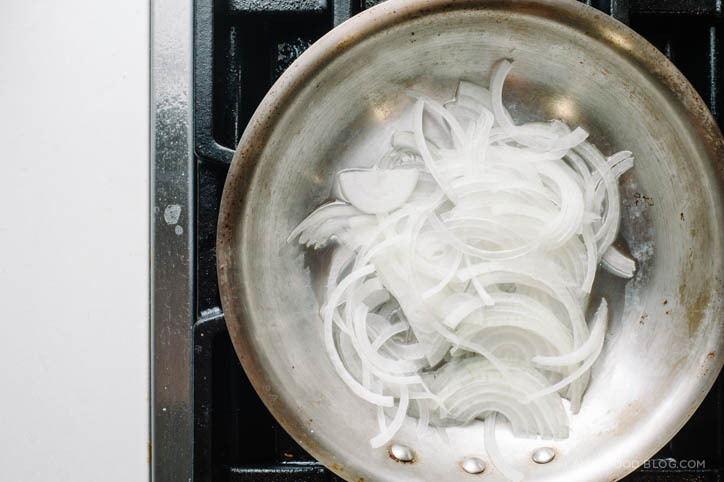 If you have loads of time on your hands, slice up a bag of onions and caramelize away. Just remember, the more onions in the pan, the longer it will take for them to turn that delicious deep golden brown. 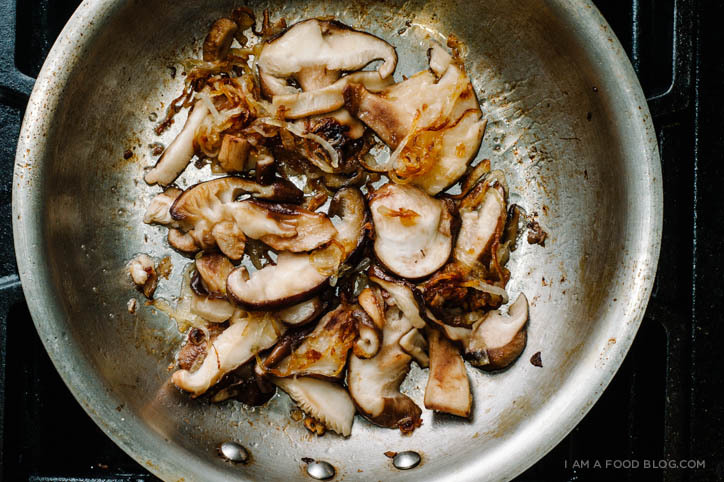 In a heavy bottomed skillet, heat up the oil over medium heat. Add the sliced onions and cook until soft and caramelized, stirring every so often, about 20 minutes. 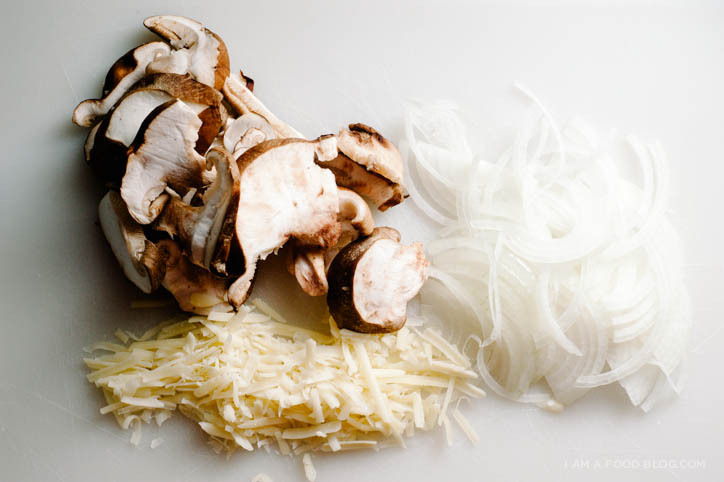 Add the butter and mushrooms and continue to cook until the mushrooms are cooked and deep brown. Taste and season with salt and pepper. Slice the puff pastry sheet into 6 even pieces. 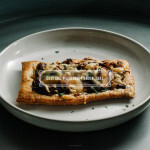 Top the puff pastry with the mushroom onion mixture and sprinkle on the cheese. Bake until the cheese is bubbly and pastry is puffy and golden brown, about 20 minutes. Enjoy with a sprinkling of flat leaf parsley. I could totally eat meals like this for every meal. So good. I love frozen food, too! (I ate a jalapeno-cheese-chicken filled PRETZEL Hot Pocket once that was so good, I am going to have to make them from scratch sometime. Because, that gave me heartburn.) 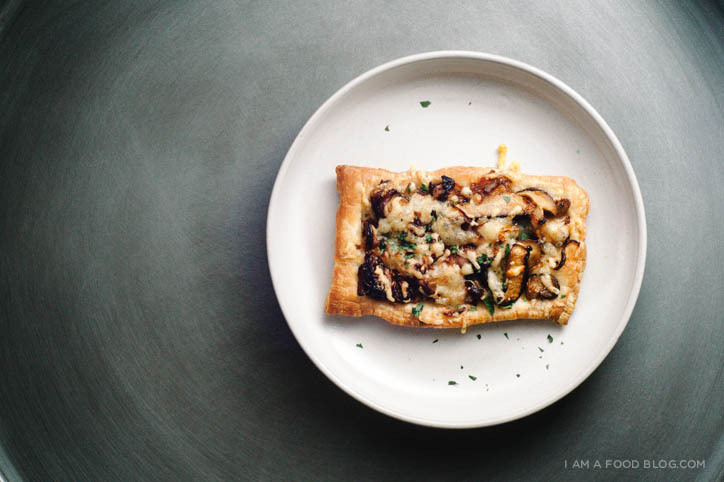 This looks so delicious, caramelized onions are one of my favorite toppings (snacks, candies), and sounds perfect with this tart! Love caramelized onions – they’re great on pizza. Have been thinking of making something like this for a while so thanks for the reminder! I love your recipe ideas. Nothing, not even your beautiful pictures, prepared us for this taste sensation. LOVED them!! This perfect – I’m always looking for more frozen meal ideas that I can use during the week! 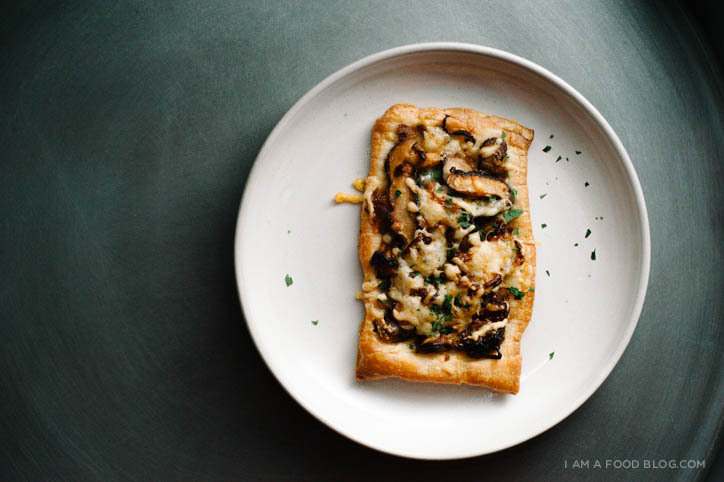 mushroom tarts with a green salad – perfect quick weeknight dinner! Recipe is terrific. Grammar is bad. And you can speed up the onion caramelizing process by first softening them up (sort of like blanching) in the microwave. Just don’t overdo it. Me and my brother? Does anyone in this country learn grammar anymore. The recipe is great, the photos are great but what ruined me was the “Me and my brother” statement. Let’s try “My brother and I” next time, OK? It should actually be “my brother and me,” but let’s calm down. This looks amazing- I can’t wait to try. (By the way, “me and my brother” and “my brother and me” are both correct. http://www.grammarphobia.com/blog/2008/12/me-first.html). She’s sharing her recipe with everyone and you wanna correct her grammar?! Go get a life! I am so fascinated with mushrooms. What is it about the flavor that makes It so intriguing ? Trying to put it mildly .. It almost tastes like the earth(dirt)at times, yet it can be soo amazingly wonderful when paired w the right ingredients as u included in your recipe ? I would love to try this recipe and especially freeze it ..so convenient !! I may try to add wine with the mushrooms or have as is and simply pour a glass to go with !